In 1948, the Texas Highway Department formed a unique relationship with the Agricultural and Mechanical College of Texas. Led by the department’s vision for improving the Texas transportation system, Texas A&M’s engineering faculty became the go-to problem solvers for Texans. Two years later, the Texas A&M Transportation Institute (TTI) was born. 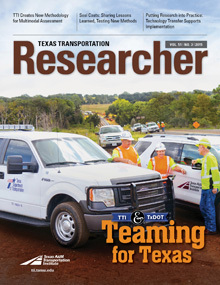 The Texas Department of Transportation (TxDOT) has since formed similar partnerships with other university-based research programs around the state. From promoting safety and mobility to helping enable economic vitality, our Cooperative Research Program has become the intellectual engine for improving the Lone Star State’s transportation system. Research enables TxDOT to deliver necessary innovations to meet the immediate needs of Texans, and to understand the future potential of the transportation system. Ours is a time when convenience and customer service are expected — where just-in-time delivery can mean the difference between profitability or going out of business. And while facilitating economic prosperity is extremely important, many of those using the roadways are everyday travelers going to the store, commuting to work or picking up the kids at school. The system has to work for everyone. Over the past seven decades, TxDOT and TTI have worked together on numerous initiatives to increase the safety and reliability of our transportation system. In part, that’s a tribute to the research excellence we’ve come to rely on from TTI. Whether it’s testing roadside safety devices at TTI’s Proving Ground, coming up with new, more cost-efficient pavement rehabilitation methods, or helping the department strategize to improve urban mobility, TTI provides essential support to our decision-making process. We’ve worked together to save billions of tax dollars through the implementation of new ideas. More importantly, we’ve saved Texans’ lives. The road ahead is equally challenging. While we may not know the exact challenges of tomorrow, we continue conducting research that can help us plan for them. Our university partners, including TTI, will be essential to that process in a couple of ways. They will, of course, continue to provide engineering expertise that advises the department on how to keep Texans safer, more mobile, and better able to compete in the global marketplace. But they’ll also do something that, really, only universities can do. While the essential function of our network — getting people and goods where they need to go — will remain the same, how we perceive transportation itself will change as we become more reliant on technology along the roadways. By inspiring curiosity in young minds across all disciplines about these new technologies and their related markets, our university partners can help us apply our state’s greatest resources — innovation, intelligence and industriousness — to maintain and further develop the most envied transportation system in the nation. At nearly 70 years old, the TTI-TxDOT partnership stands strong. We’ve laid a solid foundation of teamwork and trust over time. And that positions us well to work together to help Texas build a better future.